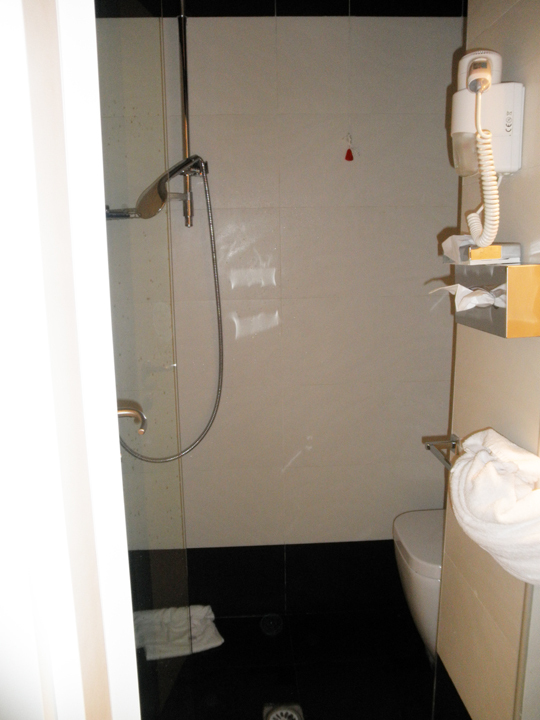 Here is the shower that’s part of the bathroom – See the lid of the toilet in the “stall” area? After spending a few minutes waking up, I get up and venture in to try the unique (and miniscule) shower set-up. 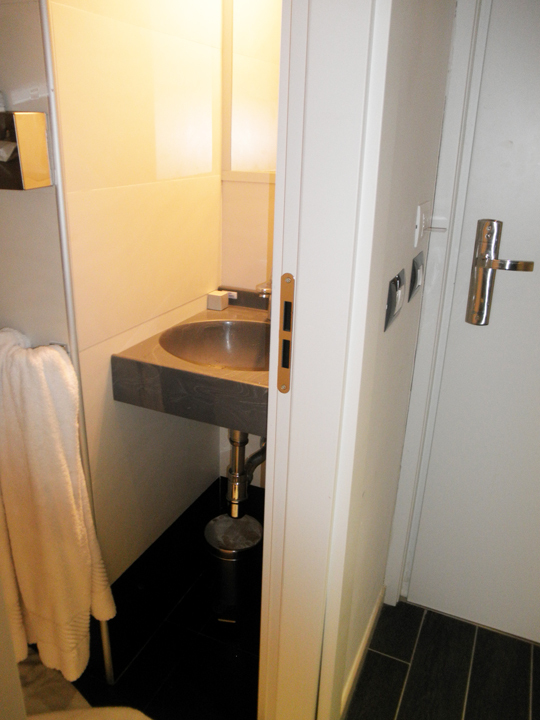 If I thought the bathroom in Lyon was tiny, I had another thing coming. 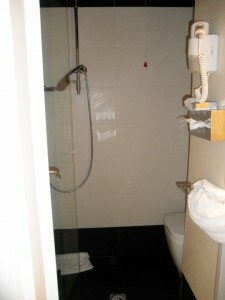 In this bathroom, the toilet is IN the shower (yes, toilet paper and all). 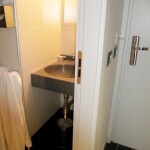 There is a narrow little nook with the sink in it (i.e., not a place for anyone of any girth), separate from the shower/toilet combination. So, it took some thinking and preparation to ensure no mishaps. First, remove the toilet paper from the toilet area. Next, cover the floor with a towel, since the shower stall is actually part of the room, with no separating curtain or door. OK, ready to give this a whirl. The shower head is actually a handheld, and, as I begin my shower, it promptly drops off the hook and sprays all over the room. Good thing I had the foresight to move the towels, as well as the TP, and not put any of my clothes nearby as I normally do! After drying things up a bit, I finish getting ready and head down to breakfast. This is quite the busy hotel – the large eating area is quite full, and there are a lot of people checking out. It’s a little odd, but overall a pretty good deal for the price. The rooms are small but clean, it’s quiet, the included breakfast is extensive, and there’s even a mini-bar in the room (although it wouldn’t do much for anyone who is into mini-bars). It contains only one water and one juice, has a blue-lit clear door and is placed right next to the head of the bed. In order to sleep the night before, I had to cover it with a towel (which didn’t completely block the light but at least muted it). Idea Hotel puts on quite an expansive breakfast spread: eggs (to order, if you prefer), bacon, Parma ham, salami, cheese, breads, lots of fruits and sweets – and everything is quite tasty. Sitting in the large modern buffet dining area, I’m almost ready for a nap, and it’s only 8:25 a.m. The train is not until 10, and the station is just around the corner. Besides that, the group of Asian women in black shirts and jeans are making me crazy. Perhaps this is the target market for this minimalist, modernist hotel chain? One of the women is walking by me, dragging her heels so loudly you’d think she was a giant. Not long before, one of them sneezed while getting juice out of a carafe – big “Ahhh-choo!” all over the juice and empty glasses, without even attempting to cover it or excuse herself at least. Then, she did the same thing again further down the buffet a minute later. Gross! At least the other three are just sitting there drinking their coffee. I have actually noticed quite a lot of Asians traveling in the Switzerland/Italy region so far – just another observation to ponder… OK, seriously?? The man with the heel-dragging woman chomps or smacks loudly when he chews. That’s the last straw — I have got to get out of the dining area. Maybe I’ll head outside to check the weather and have a smoke. After my smoke, I head back into the building, and the desk clerk (same one as when I checked in the night before) calls out to me and starts rattling away in Italian. (Did I not train him on this language thing last night? After that, I know he speaks English.) I go over to the desk, wearing a perplexed expression and shrugging and shaking my head (as in “I have no clue what you are saying to me”). He finally says (yes, in English): “Aren’t you the one who called yesterday about a room?” (I’m thinking: “What are you? Psychic? You can tell what someone looks like by talking to them on the phone?” Probably a good thing I’m not fluent in Italian…) I hold the same perplexed expression, and he finally just says, “Room number?” I tell him, and he simply says, “Oh, ok.” Hmmm….wonder what that was all about? Again, I am left wondering if he thinks I am a gypsy or what…probably those darn warrior boots ruining my image <HAH!>. I walk away thinking, as I do so often: Wouldn’t it be awesome to live someplace where fluency (or near fluency at least) in multiple languages is fairly common? Just give me the chance for some real immersion, and I’ll be happy to join the ranks. The Eurail Pass I bought was good for a certain number of days of travel within a certain window. To track/control this, they have you write each date you travel on the pass. My pass came in a folder that indicated you MUST write in each leg of your journey (date, time, route, etc.) in the lines on the folder BEFORE you travel. This information was emphasized, with the little blanks on the ticket-like pass mentioned merely in passing. I had completed the folder for my two and a half day journey and had remembered to fill in the date on the pass itself on the two previous days. (I did not do this in advance, just in case something changed. The fine print indicated you could not mark up or change anything written on the pass or it would be invalidated, so if unforeseen circumstances required a change in plans, I didn’t want to waste days on my pass. I did, however, write 11 in the month space so I only had to fill in the actual day/date of my next travel segment.) So I guess this is probably enough detail that you can guess what is coming. I have my window seat and am plugged into the iPod, so I am not particularly bothered by the seating arrangement. At this point, life on a train seems almost normal, and this is way better than the last train I rode – smelly and sardine-packed as it was. The men are obviously English and are busy discussing their business agenda and upcoming meetings, paying me no mind. Of course, I, acting completely nonchalant, am eavesdropping. Not only am I so devoid of professional discourse at this point in time that I enjoy just overhearing a business discussion, I am also eager to learn anything I can about how international business might be conducted at the ground level. The train rolls out of Milan, and I realize how large the city is and wonder if perhaps I should have lingered there and had a look around. On the other hand, what I can see from the tracks does not look overly appealing, although admittedly, trains do not tend to pass through the most desirable parts of any city. The ticket taker arrives rather suddenly (and unusually early in the trip), catching me unprepared. He requests my documents and, having learned previously the kind of trouble that comes from handing over only a reservation slip on an Italian train, I make sure to also provide my Eurail Pass. As soon as I hand it over, it suddenly strikes me that I had not written today’s date on the pass. I didn’t have to worry about that for more than a moment, though; he made it very clear very quickly that it was a grievous error (and one I would be most certain never to make again!). Copyright © 2000-2019 Michele L. Rousseau – CreativeWildCard. All Rights Reserved. Magazine Basic created by c.bavota. Customization by CreativeWildCard.